As an American, I call the fuel that makes most cars go ‘gas.’ If you’re speaking a different regional form of English, you might call it ‘petrol.’ If you’re in Australia, you certainly wouldn’t see a roadside sign directing you to purchase gas at a local station – yet that’s what we saw in the first teaser trailer for Rainbow Six Siege’s Outback map. Luckily, Ubisoft has fixed this egregious error, so we can all sleep a little bit easier tonight. 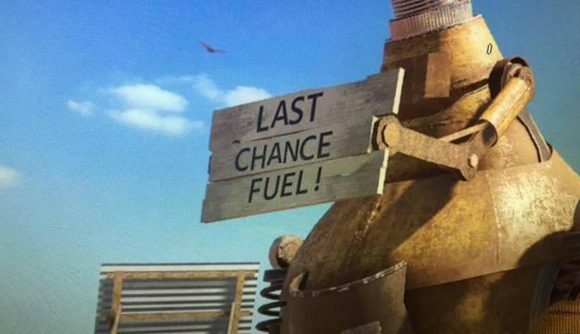 The sign held by the giant metal kangaroo on Outback now reads “last chance fuel” instead of “last chance gas,” as noted on Reddit. Yes, in theory, it should say ‘petrol,’ but ‘fuel’ covers all regional bases and importantly it ensures that diesel is also covered in all this. After all, that crashed nuclear convoy has to be getting an appropriate means of combustion. Here’s hoping future developers learn a lesson from these bits of cultural insensitivity toward Australia – which is that we all love making jokes about regional English dialects. Yes, there is more profound Siege news today, like a teaser video showcasing Mozzie and Gridlock – the two operators who leaked so long ago now. We don’t have official confirmation on those names just yet, though the leaks are getting harder to ignore with every new detail.